After doing some research I have decided on using Team Task Manager for managing my projects and resources. I want to categorize my tasks according to their status in Team Task Manager. How do I list all the tasks which are critical or important? Team Task Manager lets you add visual tags to categorize your tasks. Visual Tags are in the form of interactive images, icons or identifying marks. 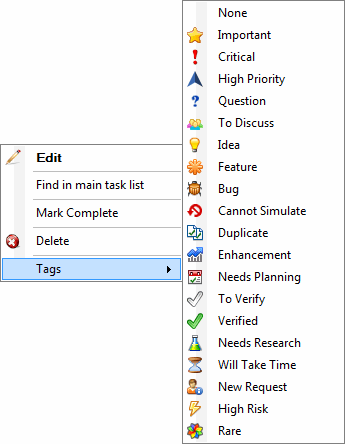 Tagging is essential to segregate tasks according to their status in Team Task Manager. You can add visual tags to your tasks and filter them by the type of tag. Clicking the filter option lists the tasks according to their tags. This makes it easier to view the category of the tasks in a sequence.